I was watching a Today Show Parents segment called Through Mom’s Eyes and it featured an interview with Sonya Curry, the mother of NBA superstar Steph Curry. In the six-minute segment, Sonya mentioned how she once didn’t allow her son to play in a basketball game when her son was in middle school because he didn’t do his chores the night before. ”We only work as a family if everyone does their part. It is not my job to do everything for everybody,” the mom of three grown children said to NBC broadcast journalist Sheinelle Jones. Oh my goodness. What a lesson learned. There was of course much more in that interview than chores, and it is evident that mom Sonya has an endearing, humble relationship with her son; with her insistence on her son following through on his commitment to doing his chores, it seems that she wanted to make sure he stayed grounded in what was important – faith and family, which was one of the main takeaways of the interview. The importance of chores goes beyond of course just the idea of parents not wanting to do everything for their children – it’s a bigger theme than that. I believe having our kids do chores makes them feel that they are an essential part of the family. It gives them some “skin in the game,” and helps them not to become entitled. Every individual member is here to make the family function, and that requires the everyday ordinary work of doing the dishes and setting the table and folding the laundry and clearing counters in the bathroom. Teaching our children to do chores is something we can begin at an early age. At a young age, our kids usually love doing chores. Let them. It is fun for them and they take pride in what they can do, “all by myself.” I remember my kids from about the age of 3 could place forks and spoons on the table for a meal, for example, or clean up their toys in their bedrooms. Young and older alike, all stages and ages, all in the family need to help make the household function, no matter what. 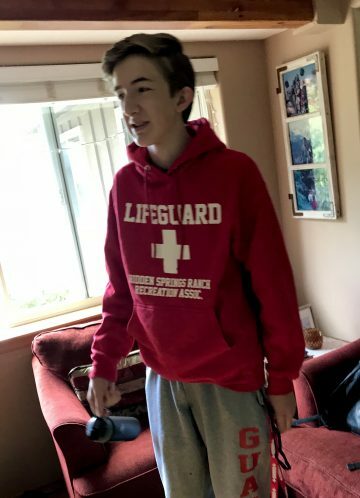 I remember once last summer asking my youngest son, who is 15, to unload the dishes and he said,” I worked today,” which was true — he had a part time job as a lifeguard at the local pool, which is so cool; he also works as a soccer referee, which is also awesome. But, I said to to him that we still need his help around the house. My husband piped in agreeing, adding that he works full time and he also does dishes and folds clothes and just does what is needed around the house at any given time. We are all in this together. We are family. And we all matter and we all contribute and we are all important to keeping our family household going. We only work as a family when everyone does their part.